Really great Danish band I ran into while I was attending The Raveonettes' gig @ Vega in Copenhagen in December 2011. 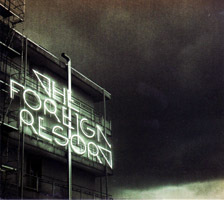 The Foreign Resort proved an awesome support act on the evening and I went and bought this EP right after the gig. The music and the singer's voice remind me a lot of early The Cure and Joy Division and I think it's really nice to find a cool band like this, that you had no idea existed before you bumped into them by chance. If you love that old sound near year 1980 then I'm sure you'll love this band and this EP. Highly recommended! I just found out that their full-length 2010 album "Offshore" is just as great. Really cool band this is.